It's been so long since I've done a "Music Keeps Me Spirited" blog post. I've been wanting to do one for so long but I haven't been feeling a song. Then of course two ideas came to me, but now that it's spring, I decided to start with white rooms. You know the 1968 classic song from Cream, White Room, right? I'm a huge Eric Clapton lover so of course that makes me a huge Cream fan. If you don't know the song you should really listen to it below. Although the song first starts out with "In the white room with black curtains", this post will only be about all white rooms. But if you follow along on this blog you know I'm a big fan of the classic black and white combo. The thing with white rooms is they can take on many different feelings. You can go with stark, bright white with minimal lines and you've got an ultra modern room. Then you can get a more country feeling, with a rustic white, by adding more creamy, yellowish white mixed with some aged furniture. Then there's the sophisticated white, that is a mix between the two. You have layers, upon layers of many different shades of white. It doesn't feel cold, but still is a white room. 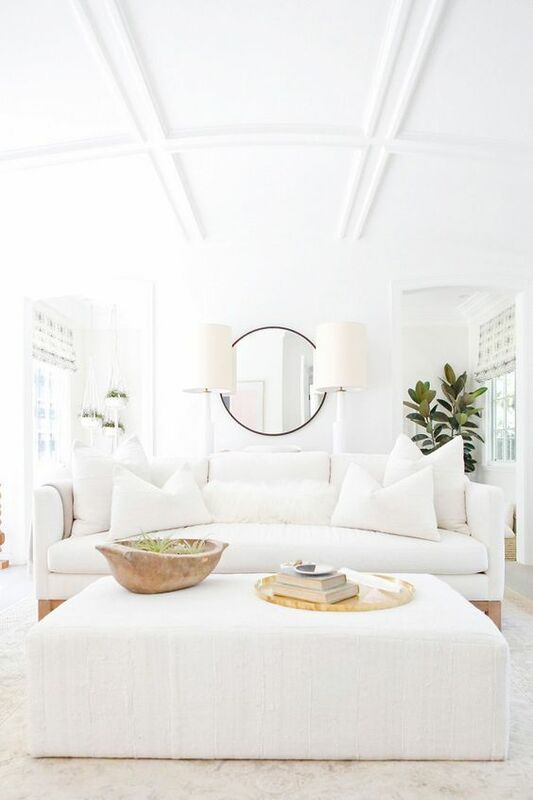 For me personally, I think white rooms are the most difficult rooms to design. I crave the sophisticated white, but it takes a lot of practice, and learning when and where to stop. It's learning that balancing act and knowing how and where to add different textures. This room is very parisian minus all the ornate trim details and herringbone floor. But is an inviting, feminine space. a sort of glammed up country space. The rustic painted floors are giving the country feel, while the crystal chandelier is all about glamour. Another truly feminine space. There's no way Brad would ever go for all these pink and purple flowers. But remember honey, I'll take white peonies any day. There's something about metals and wood that really warm up any space, but they really work their magic in all white rooms. Note how this room has many different shades of white. There's some bright whites, but then there's the more "dingy" whites. The more "dingy" whites help bring out the warmth of the wood pieces. There's not much to this room, but it really speaks to me. I'm thinking it's the chandelier. I like the shape of these small chairs and also the shape of the nightstands. All this room needs is some simple window treatments and it's ready to go. 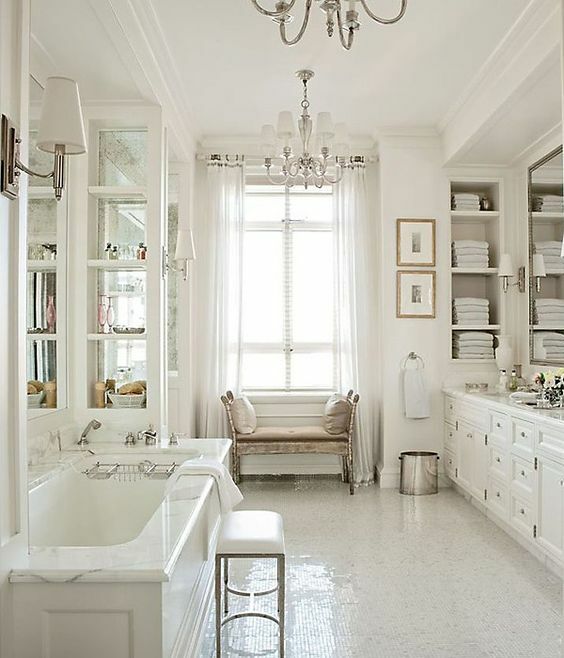 You've probably seen lots of white bathrooms and are probably keen of them. My thinking is it's all about the feeling of being clean. "So fresh and so clean clean". Hello high school and Outkast. Mother, don't worry about it. 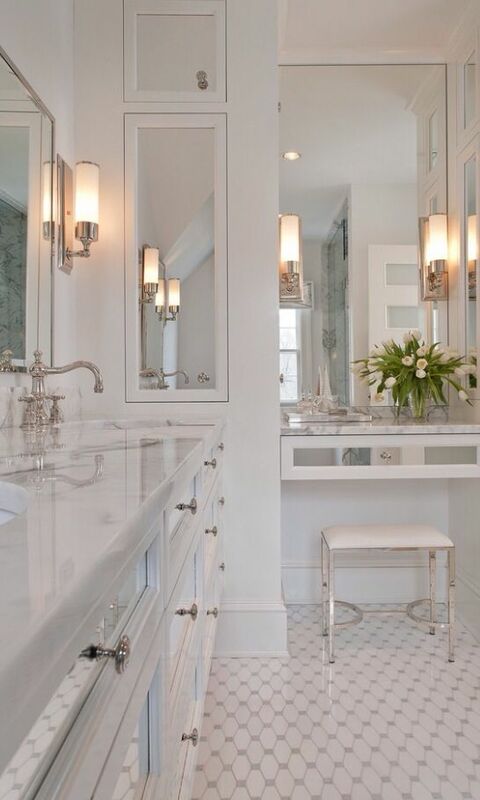 There is beauty and a sense of calmness when you enter an all white bathroom. All you need is candles and a glass of wine and you're set. Clearly these people feel very confident in their nakedness or they're waiting on their window treatments. Either way, I'd take it...with window treatments. Let's be honest, it's the funky chandelier that makes this space. Designed by Lilly Bunn. 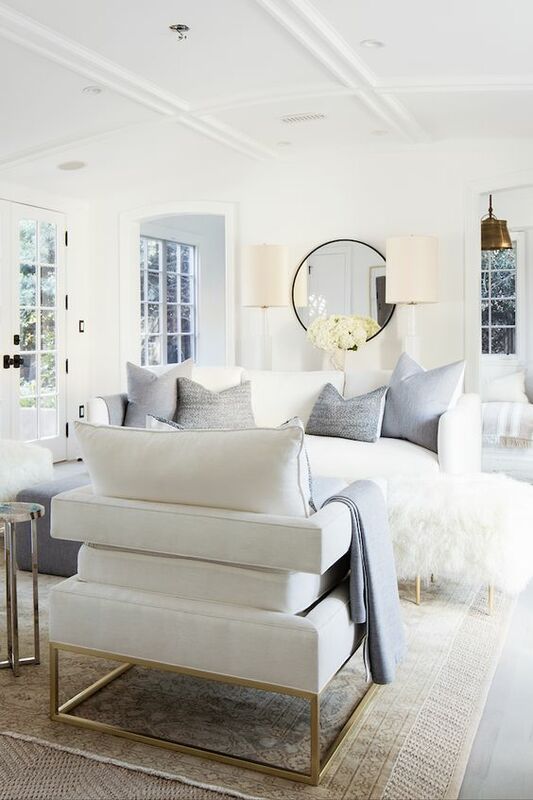 Mirrors are such a great way to bounce light and make a room feel bigger. add those to an all white room and you'll feel like you're in a 1,000 sq. ft. bathroom. i had no idea so many people were so confident in their bodies. Thanks so much for reading. I'm sorry I didn't post last week. I was busy soaking up spring break with my boys.